In honor of throwback Thursday we have decided to take an old, classic recipe and modernize it in a new, healthy way. Now what in the world can be more classic than spaghetti and meat sauce The dish has been around for thousands of years and still serves as a staple comfort food for many. 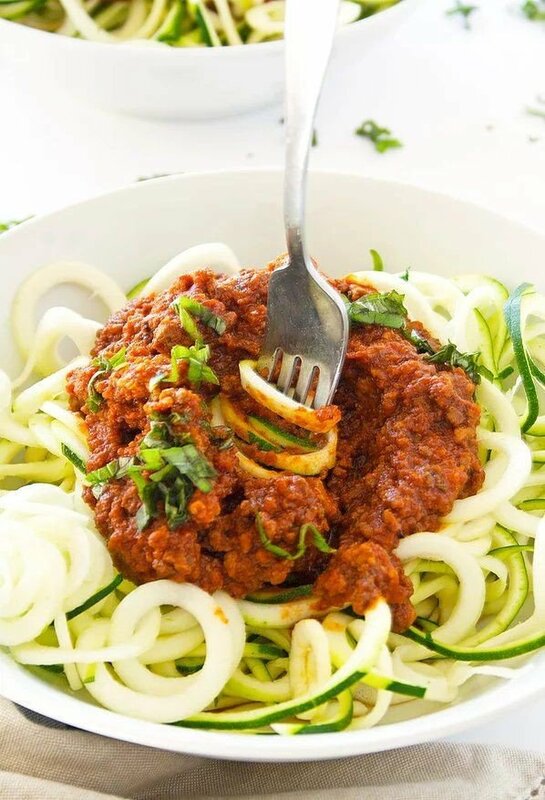 However, we all know that spaghetti isn’t exactly the healthiest of foods and so we’ve decided to substitute the gluten rich noodle for a lighter and delicious alternative, zucchini noodles, or as we refer to them “zoodles”. For the meat sauce portion we have substituted the ground beef, which when bought frozen can contain tons of preservatives, with lean ground turkey, giving us a lighter leaner protein as the core of our dish. Now, we know your hesitant because how in the world is a zucchini going to taste like a noodle And we cant tell you why it works but it just does. We promise this meal is not only delicious, but it is kid friendly, and is sure to keep you satisfied. Drizzle oil in a large saucepan over medium-high heat and saute onion, celery and garlic until fragrant, about 3 minutes. Add ground turkey and cook until crumbled and brown, draining excess liquid as necessary. For the zoodles, drizzle avocado oil in a large skillet over medium-high heat and saute garlic until fragrant. Add zucchini noodles and cook for about 1 to 2 minutes until tender. *If you didn’t already add salt while the water was getting soaked up feel free to sprinkle a little on them now for flavor.